While the Chelsea players celebrated, a member of the Chelsea coaching staff was caught running across the face of the United bench as he celebrated while fist-pumping directly in front of Jose Mourinho. The United boss clearly wasn’t impressed, as seen in the video below, as he jumped out of his seat and tried to get at the man in question, who has since been identified as Marco Ianni. 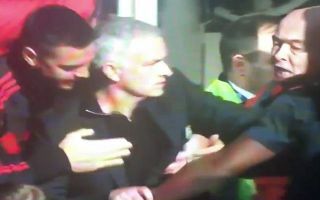 Fortunately, stewards were on hand to hold the Portuguese tactician back to avoid the situation from getting much worse, with Mourinho eventually calming down and returning to his technical area. Nevertheless, that isn’t great sportsmanship and Maurizio Sarri was seen speaking to Mourinho shortly after to calm the situation down and to perhaps even apologise on behalf of his staff. Honours were even at Stamford Bridge, but tensions were undoubtedly high after the full-time whistle as Mourinho was also seen signalling three fingers to the stands to signify his three Premier League title successes.